I know that the last recipe I shared with you featured peanut butter. But if you’re even a little bit familiar with this blog, you’ll know that it’s at least 37% powered by peanut butter. I have a long-time affection for it, and I don’t anticipate it will be going away anytime soon. 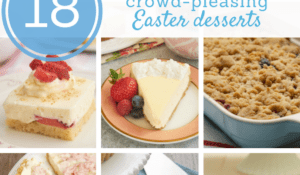 I’ve made all sorts of things with peanut butter, from bars to pies to cakes to cheesecakes. But cookies may very well be my favorite way to bake with peanut butter. 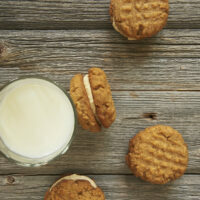 There’s something so comforting and nostalgic about peanut butter cookies. I know I can certainly never resist them! These particular peanut butter cookies stray just slightly from the traditional with the addition of oats. As oatmeal cookies are another favorite of mine, I am downright giddy to combine those two cookies into one! And quite a cookie it is! These guys are big, thick, significant cookies. There’s nothing dainty about them. You’re going to want to hold on to these with two hands while you enjoy every single bite! 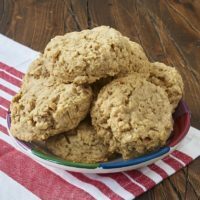 These big, thick Peanut Butter Oatmeal Cookies are perfectly sweet, nutty, chewy, and delicious! Preheat oven to 350°. Line baking sheets with parchment paper or silicone liners. Whisk together the flour, baking powder, and salt. Stir in the oats. Set aside. Using an electric mixer on medium speed, beat the butter and brown sugar until light and fluffy. Mix in the peanut butter. Add the egg and vanilla, and mix well. Drop the dough by 1/4 cup (4 tablespoon) portions* onto the prepared pans. Bake 10 to 12 minutes or until golden brown. Cool the cookies on the pan for 5 minutes. Then transfer them to a wire rack to cool completely. *A 4-tablespoon cookie scoop works wonderfully for portioning the dough. 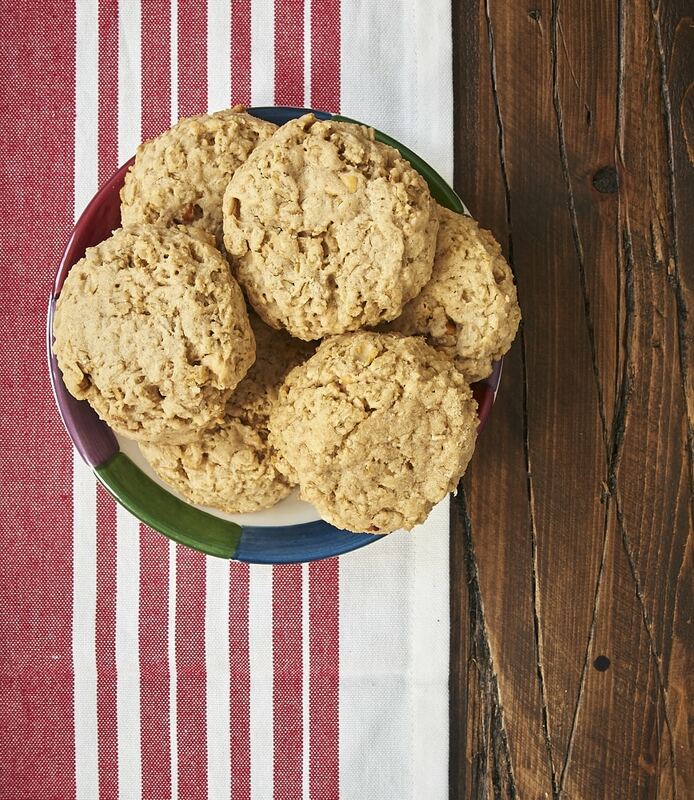 These Peanut Butter Oatmeal Cookies are my addition to April’s Cookie of the Month. This year, some blogging friends and I are baking cookies every month. This month’s theme is peanut butter, one of my favorites! 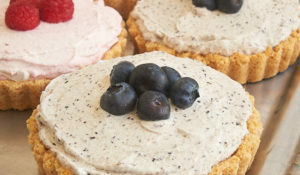 Be sure to visit these blogs and see their tasty peanut butter creations! 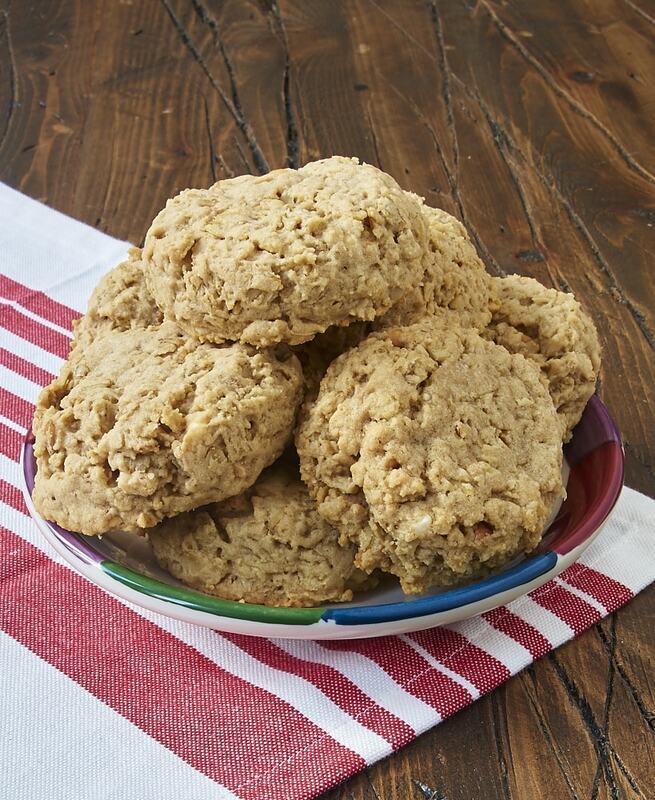 I adore oatmeal cookies—and adding peanut butter only makes them more irresistible!!! A simple, classic cookie! I love how thick these are. Pinned! These look delicious! I bet they would even qualify for breakfast since they have oatmeal in them 😉 Have a great week! We love peanut butter cookies and we love oatmeal chocolate chip cookies, so Im sure my family would adore these. Can you tell me if they are chewy and moist or more of a crispy cookie? Im assuming that with all the brown sugar they are chewy…but just wanted to make sure. We are a chewy family all the way! Hi, Bryn. They’re definitely chewy and soft! These cookies look delicious and yet so healthy! They are perfect for after-practice snacks for kids! These look great Jennifer. I think it is great we have other nut butters available if PB ever needs a sub but I’m with you on it being the greatest! 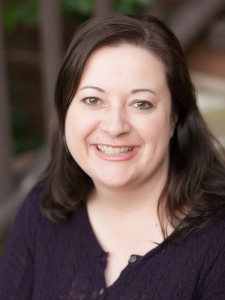 Jennifer, don’t ever apologize for posting another PB recipe! Besides chocolate, it’s the only other substance flowing through my veins 😉 These cookies look so thick ‘n chewy! You’re totally right – nothing beats the comfort, nostalgia and straight-up deliciousness of PB cookies. It’s ONLY 37% powered by peanut butter?? I think mine is closer to 87%. Haha! Love this flavor combo! Great cookie, Jennifer! I love the “37% powered by peanut butter”. That’s awesome! What aclassic! I love any and all oatmeal cookies (the texture is unaparalleled) and I love peanut butter 🙂 So yum! there’s never too much peanut butter! 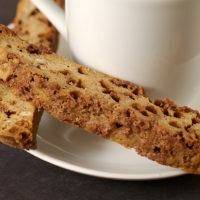 I love how chewy and hearty these tasty cookies look!!! Gotta love a good peanut butter cookie! Great idea to add oatmeal. Then I can eat it for breakfast, right? I made these cookies but I thought it wasn’t sweet enough. The first batch I flatten them, seemed better. I don’t think I’d make these again. I’ve tried so many of your baking things and enjoyed them. Thank you for sharing. Hi, Barbara. You can try adding another 1/4 cup of brown sugar if you’d like these sweeter. I made these are they were horribly dry. They actually resembled the dog cookies I make my pups at Christmas time! Anyway to make them more moist? Hi, Julie. I found these to be nicely moist, but there are always differences in measuring techniques and oven behavior. 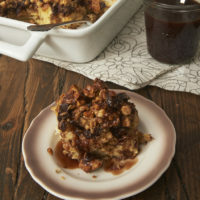 I would suggest adding another 1/4 cup of brown sugar if you don’t mind a bit more sweetness. Alternately, maybe a tablespoon of milk. Thank you Jennifer for your comment. I will try them with a little more sugar. A friend suggested to add walnuts and raisins. THIS IS THE BEST PEANUT BUTTER OATMEAL COOKIE RECIPE!!!! I FOLLOWED THE RECIPE EXACTLY WITH THE ADDITION OF ALMOND EXTRACT. THANK YOU SO MUCH FOR THE RECIPE. Just made these & they are so good! Thank you for the recipe! My only mod was I did heaping tablespoons instead of 1/4 cup each. Next time I might try adding walnuts & a dash of something-cinnamon or maybe even pumpkin pie spice. I’m glad you like them, Aimee! I love the idea of adding some spice! I followed the directions, no substitutions. They are exactly as I had wanted mild taste of peanut butter not overpowering like some, definitely a make again recipe. That’s great to hear, Agnes! Followed the recipe exactly. The cookies didn’t spread at all and were rather heavy and dry. Shouldn’t they have baking soda in them instead of or in addition to the baking powder? Hi, Lisa. There are several reasons cookies might not spread. Too much flour (or not enough fat), a dark pan, and inaccurate oven temperature are the usual reasons. Your description of them being heavy and dry makes me think there was too much flour in the dough. You might want to read through my tips for measuring flour to make sure you’re not inadvertently using too much. They shouldn’t need more leavening, as this amount of baking powder will do the job. Of course, if you prefer a flatter cookie, you can always adjust the leavening if the other things I mentioned don’t need to be adjusted. This is the first time that my mom let me bake myself. 🙂 I absolutely love peanut butter cookies, but I don’t get to have them very often. I decided to try this recipe, and overall I really like them. However, there were some tweaks that I made- four tablespoons per cookie seemed a bit huge, so I made them more like two tablespoons. It yielded a little over two pans, and the first one I learned that instead of eyeballing them, it would be easier to weigh them. One ounce balls worked perfectly. Also, flattening them a bit is a good idea because they don’t spread at all in the oven. They still bake fine without flattening them though, so if you don’t mind them in more of a ball shape that works too! Of course I had to decrease the baking time as well. Flattened out, they baked for about 7-8 minutes, but you have to keep an eye on them to avoid over-baking. I would definitely make these again! Hi, Alex! Sounds like you did a great job on your own. I’m glad you liked the cookies! Too dry. Not sweet enough. And they are crumbly and fall apart. I won’t make again. Hello! We tried this recipe at home and it was interesting. The cookies turned out nicely but they are too dry. 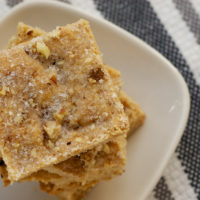 The peanut butter taste is delightful and the oats added a lovely texture. 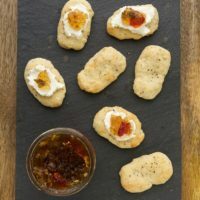 I want to make them again but with an improved recipe. 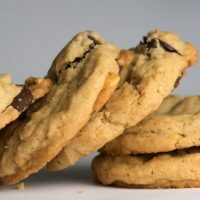 How do you think I can make the cookies more chewy and soft, and less dry and crumbly? Hi, Monica. I don’t find them dry at all, so my first guess is that your batter had too much flour added to it. I’d recommend reviewing my tips on how to measure flour. 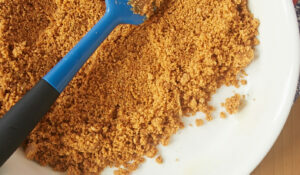 If you’re still having troubles, try adding a little more brown sugar (a couple of tablespoons) or maybe an egg yolk. Can I use margarine instead of butter? Hi, Mary Kate. I don’t recommend baking with margarine. The fat to water ratio is too different from butter to work as well.